The prospect of aerial bombing of New York is being addressed. 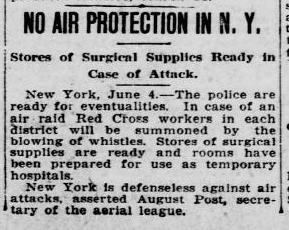 Red Cross volunteers will be hailed by whistles and surgical stockpiles are being readied. Another round of the draft will call down 269 men from Topeka, KS. Source: "No Air Protection in N.Y.," Kansas State Journal, Topeka, Kansas, June 4, 1918. Page 1, Column 7.